Man at Arms is just great isn’t it? 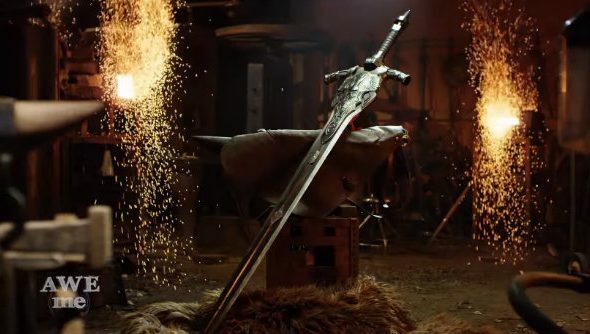 The group of modern blacksmiths do some fantastic work at recreating fictional weapons from games and movies, and Dark Souls’ Greatsword of Artorias is one of the most intricate and grandiose yet. I wonder if any of the upcoming PC games will get the Man at Arms treatment. You might need level your strength up to effectively wield the greatsword in FromSoftware’s fantasy series, but then you can run around with it in one hand and a tower shield in the other. As you can see from the Man at Arms video, you would probably need to be built a bit better than your average undead to pull such a feat off in real life. Hell, most of the people in the video can only drop it onto the targets. Wouldn’t be much use in PvP, I’d wager. Dark Souls 3 releases in the West on April 12, and you can read our in-depth PC review here.